Towards the end of our stay in San Cristóbal de las Casas, we had the opportunity to visit two highland Tzotzil Maya villages: San Juan Chamula and San Lorenzo Zinacantan (often just Zinacantan, or Sotz'leb in Tzotzil). In Zinacantan, we had the opportunity to visit a Tzotzil house owned by a woman called Maruche (in Tzotzil) or Maria (in Spanish). She and her daughter Carolina were extremely talented weavers and I looked forward to the opportunity of sitting in a Maya household and attempting to practice my Tzotzil. Entering a Tzotzil household is an event redolent with etiquette, hospitality and set phrases of politeness, a formal ritual which makes Japanese etiquette seem positively casual. I was very proud to enter Maruche's house in the correct manner, which impressed her and she clearly approved of, while her daughter found it amusing that this lanky Englishman knew some batz'i k'op - real words - but hardly any Spanish. 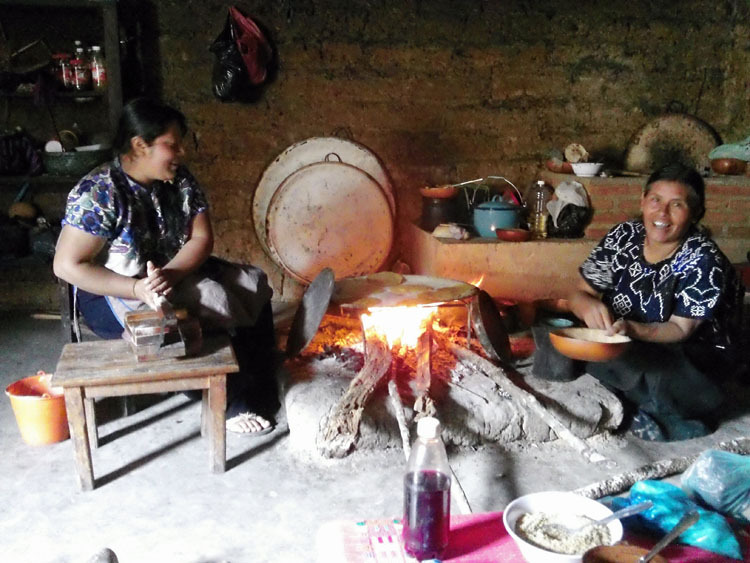 As we sat there, with Maruche and Carolina making tortillas, I began to become aware of how, even though I was sitting in a fairly simple home with no mod cons, I was in the presence of two people who were heirs to a three thousand year old culture, much older than my own. Maruche's shrine to the Virgin of Guadalupe seemed to be little more than a Catholic veneer on a much deeper indigenous core, and as we talked in a halting mixture of Tzotzil and Spanish, I started to feel the presence of this ancient ocean of Maya identity. 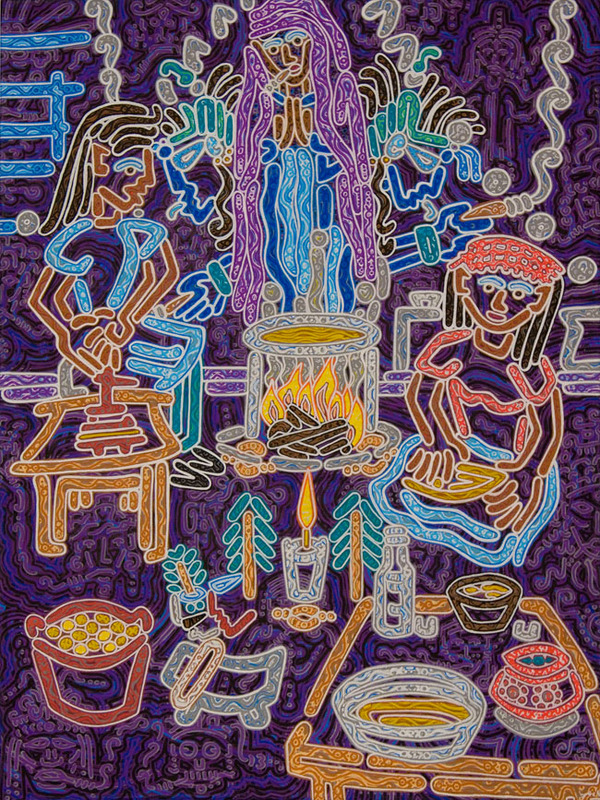 This was a beautiful enough experience to represent artistically, Maruche and Carolina's daily tasks overseen by Guadalupe and more subtle images of Maya ancestors. bueno mi xu' chi'och, me'tik? mi chak'an ave' vaj xchi'uk chenek'? hello, are you here, ma'am? ok, may I enter, ma'am? do you want to eat some tortillas with beans? will you drink a little sugarcane liquor?